← anyone notice on the iShares commercials? we went shooting Saturday. it was so much fun!! 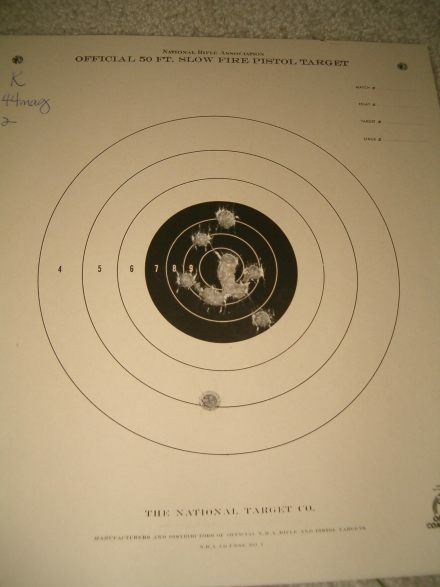 because shooting is fun!! 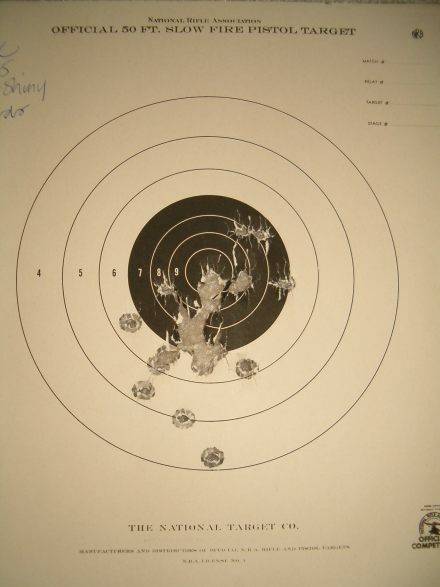 i fired my carry gun one-handed for the first time ever (ok, i fired one-handed period for the first time ever), and i’m really proud of the results! 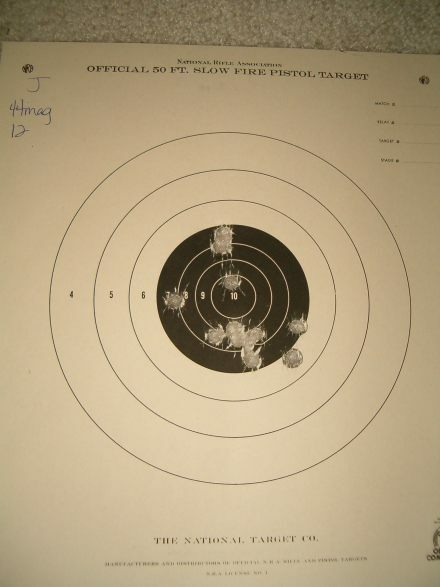 wow, shooting left-handed feels weird to a righty. 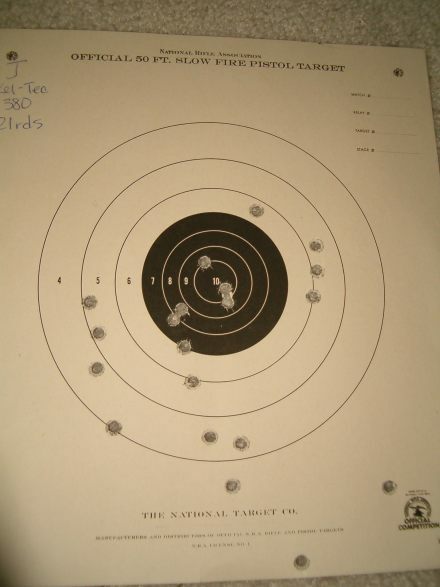 the .44 magnum Colt Anaconda – this time we fired it first so i’d actually be able to hold it up. last year, we fired it last, and my shoulders were so tired that i couldn’t hold up the stinkin’ gun, it’s so heavy. so this time was much better. 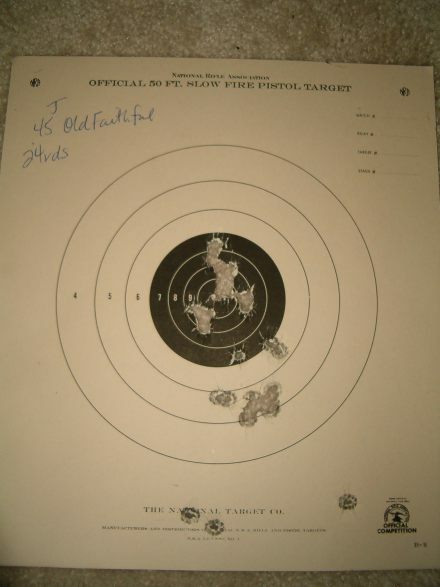 here are our targets from about 7 yards (12 rounds). our carry guns – Frank his Kel-Tec (.380) and me the Walther P99 (9mm). the Kel-Tec was really having trouble Saturday, kept jamming. and i cleaned all the guns last time, so it was probably my fault. 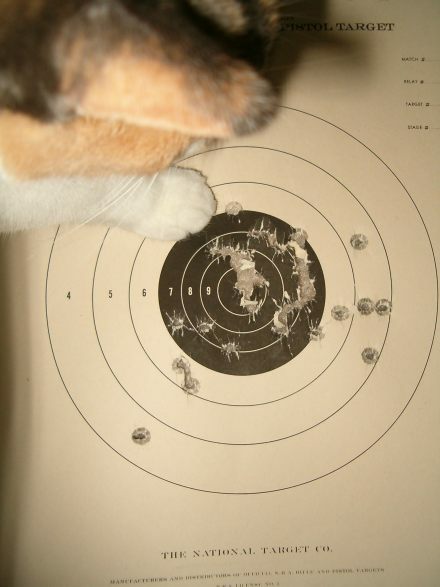 he also tried out point-shooting, where you just point at your target, don’t line up the sights, and shoot. 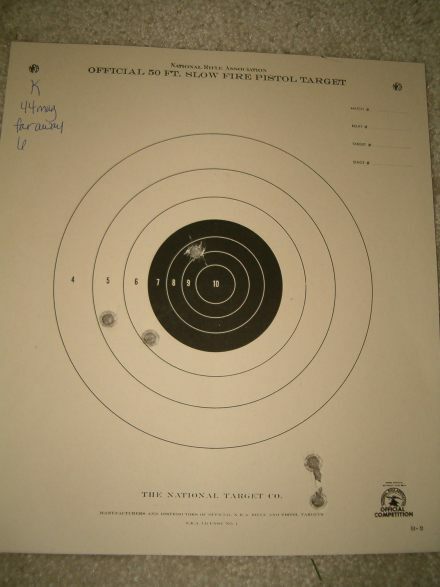 you can tell which ones were point-shooting and which were aimed shots. from 7 yards. i did really well with the P99. every 16-round magazine, i fire the first shot double-action, which is how i carry it. these are all from 7 yards. here’s 2-handed, 16 rounds. look at Minerva, trying to take credit for my handiwork! 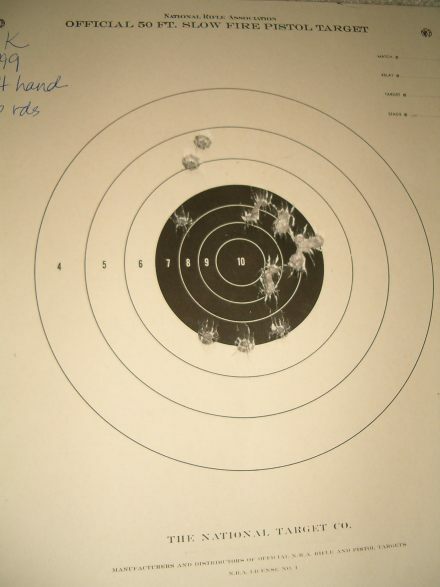 and this is left-handed, 16 rounds. we decided to not fire the Glock 17 Saturday, though we took it with us. 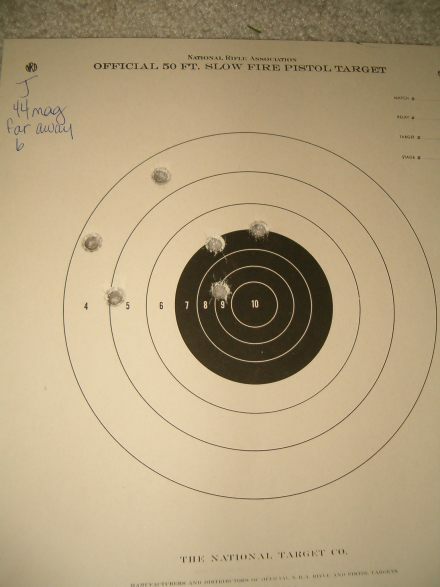 we were having too much fun with our carry guns and then eager to get to the .45s. here’s Mr. Wonderful with Old Faithful. for those unfamiliar with our guns, Old Faithful is an M1991. 24 rounds, from about 7 yards. and here’s me with Mr. Shiny (the beautiful stainless steel, Mil-Spec 1991). 24 rounds, from about 7 yards. after the .45s we were both ready to go. it was a fun fun shooting day! holy cow. i don’t have a guns category. I wouldn’t blame your cleaning for the P3AT’s malfunctions. They’re known to do that from time to time. Mine is HORRIBLE. It’s probably best to send it back to KelTec (which is easy because it’s intrastate) and have them do their fluff ‘n’ buff on it. If they can’t make it work they’ll give you a different one. I am stealing this for the next CoC. When do we get to see Minerva’s targets? Is this weird or what? These are the same weapons that my wife and I use for conceal carry. What a small (caliber) world. Nice shootin’. Is it always handguns with you guys or do ya’ll use shotguns and rifles too? Get some of those shots in too. Nice work with the P99. Very good grouping. 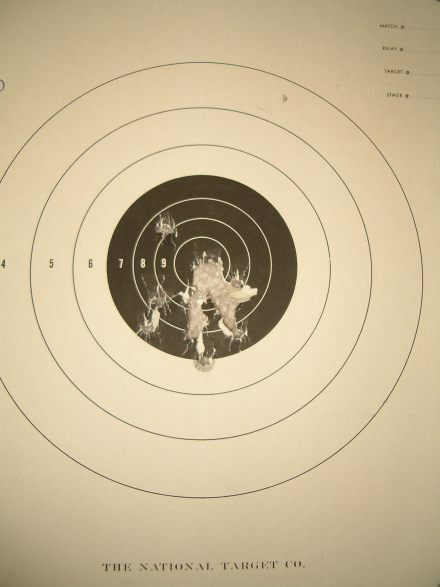 I doubt I’d get much better with the ’44 mag at 7 yards. And stop making me jealous of Mr. Shiny! Wow, that’s some fine shooting. Let’s see how good Minerva’s aim is. There’s nothing more appealing than a babe with a blaster!! Frank is a lucky man. If you and Frank are ready to take your CCW skills to another level, I’d recommend you look around for any local IDPA matches. Holster work, movement (both yourself and the target), cover, reloading–all add complexity to shooting, yet they’re generally absent from the typical stand-straight-up-in-front-of-the-target indoor ranges. And, it’s fun too! What’s that – a Gulf War model?